The Hunts Point Collection byParker House will create a unique rustic feel which can easily be a part of industrial or cottage setting. 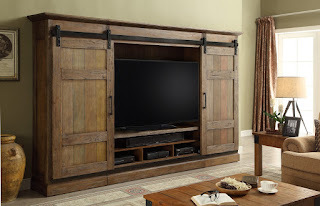 Made of Pine Solids and Pine Veneers in Weathered Pine Finish, this collection boasts plenty of storage with the adjustable shelves, sound bar area, and drawers to meet every media need. The Arabella Bedroom Collection by Pulaski will add a vintage style to your bedroom. Its beautiful upholstered headboard has button tufting and wood trim. 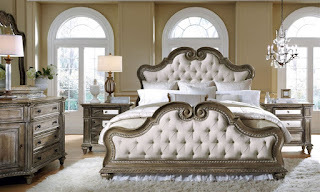 The gracefully curved frame of its headboard, footboard, and beveled mirror give them an elegant appeal. The drawers of the dresser smoothly glide for effortless opening and closing. You can store your everyday essentials in these spacious drawers. The Malibu Collection by Jackson Furniture offers modular pieces that can be used to create multiple configurations, fitting perfectly in the desired space. This group presents Casual Contemporary Style with Reversible T-Front Seat cushions. The pieces are upholstered in Luxury Plush Polyester Chenille Fabric in Taupe color, enhanced with colorful abstract Accent Pillows.